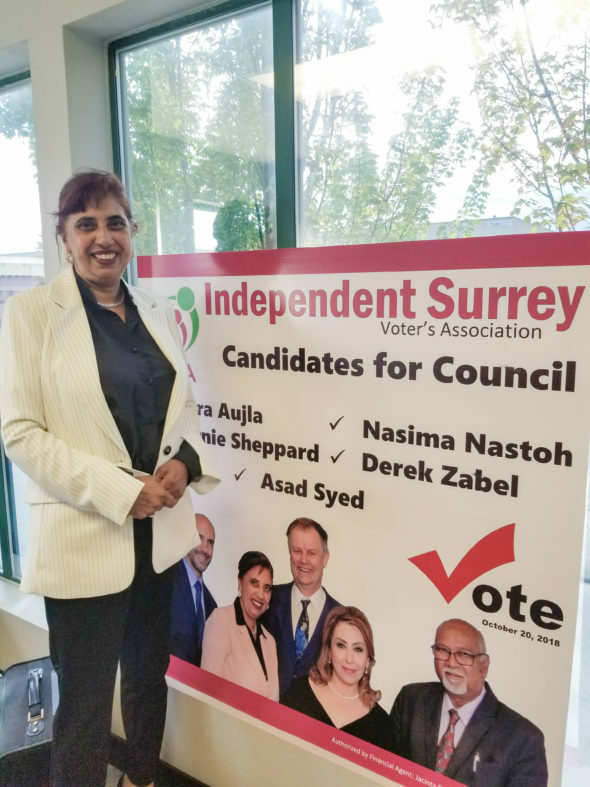 Campaigning for the 2018 Surrey municipal election is well underway and a new political party, the Independent Surrey Voters Association, has thrown their hat into the ring. This party includes members of the Surrey community from varied backgrounds and professions ranging from realtors to TransLink workers and anti-bullying advocates. The party didn’t put forward a mayoral candidate in the already heavily contested six-person race, but they are hopeful that their diverse slate of candidates and their knowledge of the public’s grievances will give them an edge in the election for city council. Aujla is already familiar with Surrey politics. A former radio and television host and current realtor, she ran as an independent candidate in the 2014 municipal election and as a B.C. Green Party candidate in the 2017 provincial election. This year, Aujla joined the Surrey Community Alliance party, but had to leave when the party was dissolved following the resignation of its president, Doug Elford. Aujla assembled her team of five council candidates which includes herself, Asad Syed, Bernie Sheppard, Derek Zabel, and Nasima Nastoh. The party is running on a platform of increasing affordable housing and decreasing homelessness and crime. In addition to creating more low-income housing in the city, the Independent Surrey Voters Association also wants to invest in free after-school arts and sports programs to assist parents and protect children from turning to a life of crime. With seven parties and nearly four dozen candidates running for just eight seats on Surrey City Council this year, being elected will be a challenge. Notably, just a year ago, seeing any party other than Surrey First winning seats was highly unlikely. The Surrey First party has held municipal power for over a decade, winning every seat in the past two elections. However, with current mayor Linda Hepner not seeking re-election and prominent, long-serving city councillors leaving to join other political parties, this election is likely to result in a major shake-up.